Anti-Semitic offenses rose almost 10 percent in Germany last year, and violent attacks were up more than 60 percent, crime statistics showed Wednesday, sparking alarm in the Jewish community. Police recorded 1,646 offenses motivated by hatred against Jews, the highest level in a decade, said a government answer to a request by leftist Die Linke party lawmaker Petra Pau. Among these were 62 violent offenses that left 43 people injured, up from 37 physical attacks the previous year, according to the preliminary police data. In France, President Emmanuel Macron on Wednesday condemned an “unacceptable increase” in anti-Semitic hate speech, amid outrage over anti-Jewish graffiti and vandalism in and around Paris last weekend. 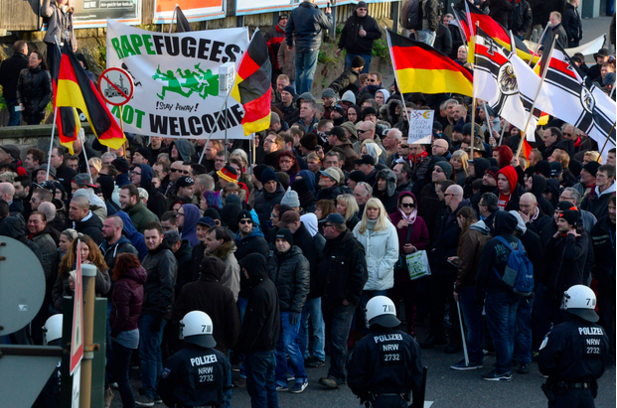 An influx of mostly Muslim refugees and migrants to Germany from 2015 drove the rise of the far-right and the anti-immigration Alternative for Germany (AfD) party, which since late 2017 is the biggest opposition group in parliament. At the same time, Germany has also witnessed anti-Semitic attacks committed by migrants from Arab states. In one prominent case last year, a 19-year-old Syrian man was convicted for assault after lashing out with his belt at an Israeli man wearing a Jewish kippa skullcap while shouting “yahudi,” Jew in Arabic. However, the vast majority of anti-Semitic offenses were committed by far-right perpetrators, the Berlin daily Tagesspiegel reported in an article on the new crime statistics. A rising number of people and groups in the “grey zone between conservatism and right-wing extremism are denying the Holocaust and engaging in anti-Semitic agitation,” she said.